Some of the most refined electric bikes on the market are mid drives. And until recently, if you wanted a mid drive electric bike you were limited to buying an under-powered and overly-priced 250-watt Euro electric bike. Or…if you wanted a powerful bike, your only choices then were a $10,000 plus USA bike (like the Optibike or the Hanebrink). Recently, several notable mid drive kits have come onto the market which allows someone on a budget to build a mid drive electric conversion that’s even more powerful than the factory mid drives. Suddenly electric bike builders have a lot of choices between putting together a hub motor E-bike, or a mid drive…which to choose? Heavy hub in the rear?…or lighter mid-drive in the middle? Our number one pick for a mid drive right now is the 48V Bafang BBS02, and for all the details, see our article, here. First of all, it can easily be installed on over 90% of the common frames available. The installation is simple enough that any average cyclist who is capable of fixing a bicycles flat tire…can install this drive by themselves. Second, the 1,000W power range (when controller is unrestricted), and small size are fantastic for most potential E-bikers. Lastly, the big surprise about this drive is that it is so quiet! Also, the 500W/25A unit runs on a more affordable 36V battery for E-bikers who don’t have extreme hills. Also, it turns out it runs quite well at 52V, so consider that as an option. The Bafang BBS02 750W mid drive. At the Interbike 2015 convention, Bafang introduced a larger version of their popular mid drive, and the “HD” stands for “Heavy Duty“. The bottom bracket on the standard HD drive is 100mm wide, so it drops right into the 100mm wide BB of the increasingly popular fatbikes and off-road bicycle frames. There are several BB widths available with the BBSHD drive, so you are not restricted to just using it on a 100mm BB width. Karl at electric-fatbike.com is the Bafang mid drive guru, and even though the BBSHD only maxes out at a slightly higher amperage (30A vs the 25A on the smaller BBS02), the extra copper mass in the BBSHD stator means that at 52V X 30A = 1560W of power, the BBSHD barely gets warm, because it is larger and also sheds heat better. Even if used at the same watts as the BBS02, the stator of the BBSHD is 66% wider, so it will definitely make more torque. Luna Cycles Currently has this game changing kit on sale for $699 here. The GNG catalog lists this kit as the “450W brushless“. The second mid-drive on our list, is also a kit that can be added to just about any bicycle frame that you like (maybe 90% of them?). See our article on this awesome drive, here. I feel this motor is a better pick for off-road compared to the BBS02 (even if you are happy with only 750W). This is because the GNG has more copper mass, and it sheds heat well, so it can take more power for longer. We will be getting our hands on a third-party upgrade kit that fixes all of the weaknesses of the GNG next month (look for our review soon). This kit has also been run at 72V X 30A = 2,200W/3-HP (with a different controller), but be aware that this level of power requires a swap to a chain primary reduction, or a wider belt. Also, the GNG allows for a stronger crankset to be swapped-in for riders who like radical jumps without bending the spindle (the BBS02 crankset cannot be upgraded). Because of the weaknesses of many of the stock parts, we can only recommend this kit at 36V, and the seller will swap-in a 36V controller at no extra charge. The GNG 1,000W mid drive (battery not shown), on a Kona Stinky. This new kit uses the same motor as the GNG. It also uses the same basic configuration, with a quiet belted primary reduction in the high-RPM half of the drive, and a narrow and strong chain in the lower-RPM half of the drive. Read our article for more information on the ultra powerful lightning rods kit. Although the motor is the same, every part of this drive is very strong and uses the highest quality components, including a 25mm wide primary reduction belt, instead of the GNG’s 15mm wide, and…a #219 kart chain for the secondary, which is rated for over 20-HP (15,000W). By moving the motor-freewheel from the right side, over to the large primary driven pulley on the left, the reduction has been improved to 33:1 (compared to the original GNG reduction of only 21:1). This kit comes stock with two chainrings, a 32T and a 48T. This kit has been run at 48V and 72V, the motor runs cool at 30A, and gets warm at 40A. Using 72V X 40A =2,800W, and this is the most power that should be run through the bikes gears. More power than this and you should run a chain directly from the motor to the rear wheel, or…use a large hub motor. The LightningRods drive has been verified to run well at 48V, 52V, and also at 72V X 35A = 2,500W. This kit is a converted geared hub-motor that is listed in the GNG catalog as a 36V/350W, or…as a 48V/400W. Its a great choice for a street commuter, see the details in our article about this drive, here. It’s just as easy to install as the BBS02, and..although it has less power capability than the BBS02, it also costs less. It makes the same amount of gear noise as any common geared hub-motor. The GNG Gen-2 750W drive. Cyclone is one of the earliest producers of mid-drives, they are from hilly Taiwan. Although this looks like a simple drive set up, the Cyclone mid drive is actually a cylindrical Headway motor attached to a planetary gear-box, providing 10:1 reduction, attached to a double freewheel. Although the steel gears of the reduction are noisier than the GNG or BBS02, they are fully enclosed to protect them from dirt. Recently in 2015 Cyclone released their game changing planetary reduction 3000w kit which offers an amazing powerful and reliable kit for only $389 from this seller. Read our article on the new Cyclone 3000w here and our build and ride report here. If you buy one of these kits I strongly suggest you spend the extra money and select a kit that’s big enough (650W or larger) that it uses an external controller. Even if you only need a lower power level, the high powered motor will be more reliable than its smaller Cyclone counterparts. This is because the lower-powered kits have the heat of the controller and motor inside the same housing. Read this entire ES forum thread before buying…it’s a great buyers guide to the Cyclone. The Cyclone mid drive, one of the early producers of mid-drives. These guys (Applied Future Technologies) are in Australia, and although they use the same motor and geared reduction as Cyclone, the rest of the kit parts are heavy duty and this fixes many of the complaints from Cyclone users. The distinctive added fins help the Headway motor shed heat much faster. The AFT mid drive, with a very beefy and well-designed mounting bracket. The EGO kit is from Germany, and even though the European Union (EU) has a 250W street E-bike power limit, the German off-road E-bike scene is very dynamic, with lots of exciting developments. Read the details of this kit in our article, here. It uses the same motor and geared reduction that made Cyclone famous. 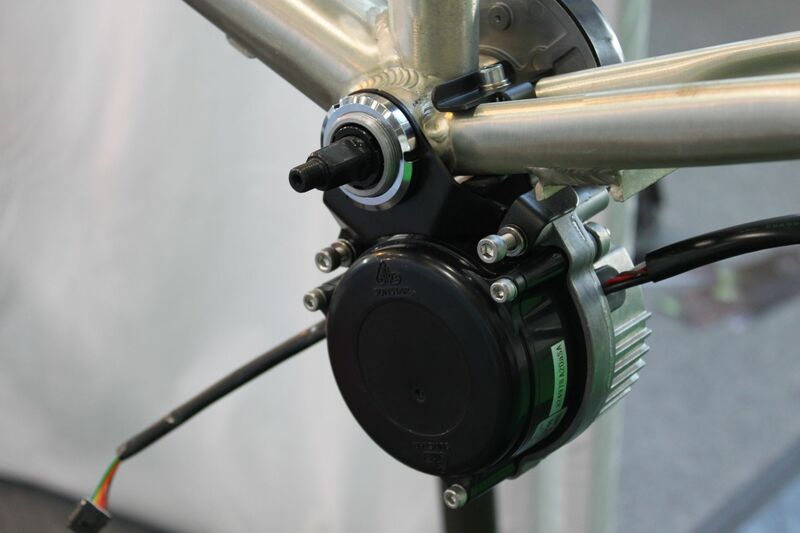 The Ecospeed drive has brackets available to mount the motor in front of the bottom-bracket (shown), or also behind the seat-tube of a cargobike, as an option. The motor is an outrunner. Formerly known as the “Gruber Assist“, it is the ultra-stealthy drive that has the motor hidden inside the seat-tube of your bike. You can read our article about the Vivax Assist here. This system provided a mild 100-200 watt boost and its only visible feature is a red button that is mounted somewhere on the handlebars. The power assist is smooth and quiet. The Vivax kit is not available in the United States as of yet, and it can only be added to a limited number of frames, so do your homework before ordering it. This awesome drive is also designed for the Yuba Mundo, Xtracycle Edgerunner, and Surly Big Dummy. It performs exceptionally well on steep hills while pulling heavy cargo. The Urbancommuterstore.com’s M-drive, mounted here on the Yuba Mundo cargobike. I haven’t been able to find a picture of the inside of the Sunstar SO3+ drive, but it appears to have only a single reduction (compared to the similarly-sized BBS02, which has a dual reduction, allowing higher motor-RPMs). This may have been adequate for the 250W power-limited EU market but the design ignores a large 500W/750W market in North America. Sunstar is based in Japan, and here is a PDF of their most recent mid drive motor system. Sunstar has a 2001 patent on this drive, and they are suing Bafang in Germany over the BBS01/BBS02 system that has recently become popular. That patent is 13 years old, so perhaps Bafang felt they were on safe legal ground in by copying it? Edit: Sunstar has announced they will debut their new Virtus drive system at the Eurobike 2014 meet in Germany. The Sunstar SO3+, pic taken at the Interbike 2014 convention in Las Vegas USA, in September. The TCM drive is hard to find any information about it. I finally found it as the optional mid drive system on “Whoosh Sport CD” in the United Kingdom. It also appears to have a single reduction. This drive is new and is VERY similar to the recently popular Bafang BBS02. This pic was taken at the April 2014 bicycle show in Shanghai, China. Pic thanks to ES member d8veh. On Alibaba, these have been seen being sold under the “BTN” label (Back To Nature). Thanks to the German pedelecforum.de member “airbox” for the link. Danke Schoen! The Xing mid drive construction is similar to the famous Cyclone, with a planetary geared reduction between the motor and the output sprocket. The motor looks like it might be the 400W MAC/Kollmorgen used by Currie, and it is rated at 370W by Xing at 24V (which would equal a 16A controller) and the battery is listed as a Lithium-Ion with 15-Ah. The Xing 24V / 370W mid drive kit. No information yet, other than this kit uses 24V and is from Europe, so it is likely a 250W system. The Achiever 24V / 250W kit. This company is from Italy. They have 250W, 500W, and 750W versions, and since they can be run at 48V or 72V, the amps should be very low. This drive should run very quietly. The Bikee Bike mid drive from Italy. 350W, 48V, EU-compliant pedelec with a 25-km/h top speed. Introduced in the summer of 2014 by the company Sachsen, the large diameter of this kit is to make up for the lack of internal gears that other similar kits use. It provides 250W, and due to being direct drive, it should likely be very quiet. Thanks to ES member Miles (from the UK) for the link. The Binova Flow mid drive kit. This is a new kit as of September of 2014. The beam across the frame prevents any twisting of the mount. The motor is the inexpensive brushed XYD-16 model found on the Currie eZip Trailz. The new mid drive kit from Bikemotive. This company is fairly new this year. They are jumping into the new market defined by the BBS02 mid drive. A new mid drive from XOFO. The interesting feature of this drive is that it has a torque-sensing PAS, and can provide 750W. For more information, click here. The Tangent Ascent uses a very compact and robust cycloidal reduction to allow the motor to spin up to very high RPM’s, and the motor is the well-known Astro (to read our article on the Ascent, click here). Plus, here is a link to a review. If you like the idea of a mid-drive system, but you don’t want to install a kit, check out our article on factory integrated mid drives, here. How may watts can one put down a regular bicycle chain and gears without tearing the driveline to shreads? I have seen as much as 8000 watts going through a traditional derailleur gear chain (see astro ebike story) with little problems as long as shifting is done with care….but that is with quality shimano components and chain. I have a mid drive 600watt brush-less motor on my trike, (split chain drive) the chain stretches out about once a year for replacement, (8 sprocket rear cluster). I have a 2015 GNG 48V mid drive, and it starts skipping under heavy load with no pedaling (pulling a bike trailer with a few kids on it). Any idea how I can stop the skipping? I was thinking about looking into a chain guide. One time, I was trying to pedal with the motor, and the chain fell off. Unfortunately, he has no upgrades for me. I have since purchased a Cyclone crankset (because the GNG unit failed in 3 days). If the chain falls off, I will get a Wolf Tooth Components Drop Stop chainring. Check the the rear cassette on the wheel and take a look at the teeth on them and see if they are worn out that could probably be the main reason why its skipping and hop in the falling off. It could have been a derailleur adjustment issue. Everything is brand new. Wattage isn’t the unit of concern here – torque measured at the chain’s drive sprocket is what counts. Motor wattage ratings are a gross measurement of power, or horsepower. The efficiency of the reduction stages, as well as the motor itself are not generally included in the manufacturer’s wattage rating. Beyond that, there’s the overall gear ratio which serves as a torque multiplier. The point is: Even an efficient low wattage motor using a very high ratio reduction system can produce sufficient torque to stress a chain and everything else at the rear wheel. Example: Picture a 250W motor driving a 100:1 reduction on a 500 lb. trike climbing a San Francisco Hill with Michael Moore as the rider. GNG now has a different version of the mid drive where the belt reduction (prone to failure) has been replaced by a gear drive at the end of the motor. Has anyone tried it? You can’t argue with the price, but what’s the quality and longevity? There are now people building after-market kits based on the GNG kit, but upgrading the primary reduction belt from 15mm to 25mm, also the new 25mm belt is USA made. Search for “Lightning Rods Mid Drive” if you are curious. It costs twice as much (insane) and doesn’t come with a controller. GNG now has their own updated version with a 30% wider belt among other improvements. You commented on the cost without commenting on quality or design or anything other factor. Not really fair. I can buy a house for twice as much as a another house, insane? Likewise you could find a car for twice as much as your current car – is that insane? Without examining the other variables (quality/features/etc) its not even reasonable to begin commenting on the cost. I don’t actually have one of Lightning Rod’s kits, so unfortunately I can’t comment deeper right now. But I sure don’t find it valuable to just rag on the cost without examining other factors of the component quality and design. Lot’s of owners of the GNG kit went to lightning rod’s dev to purchase upgrade components because of lack of quality on the “cheap” kit. I am on his build list, in part due to the positive reviews here and on endless sphere. Hopefully I’ll have one in my hands in a while and will be able to truly evaluate whether it was worth the additional cost. The current GNG mid drive uses a 30% wider belt among several other improvements (stronger bracket, long lasting components, much better crankset). I don’t doubt the quality of the Lightning Rod unit, but I sure am not going to pay double for what to me are minor improvements (improvements that have virtually zero impact anymore). The current GNG is much better than the GNG it replaced. GNG addressed the weak points of the previous model and updated its looks. The Lightning Rod unit may have been an awesome upgrade last year, but now the game has changed. Another thing to note is that the GNG never really had serious issues. Only people that ran custom high-wattage setups caused parts to fail. Now that the GNG is upgraded, I’d be a fool not to try it first, especially since I’m not overvolting the unit. At $336.80 it’s a steal. And now that I’ve tried the 2015 GNG kit, I’m not happy with the crankest clutch. It failed after a few days with very light use. Update: I have now moved on to the Cyclone 3000. It is so much better! There is no reason to buy a GNG over a Cyclone. Update: I now also have a BBSHD, which is silent! I love it! You don’t know Ecospeed. If you did, and if you tested, you would realize that Ecospeed should be rated as the number one mid drive system out there. Based on years in business, satisfied customers, technology, engineering, and service. I know, since I have had Ecospeed for 5 years or more and I have two of the latest iterations of Ecospeed (one mtn bike and one recumbent) and use it to climb 2500 vertical feet of logging roads regularly. And it is fantastic. Agreed, I have two (2) Ecospeed units (one on a EZ-tandem, one on my RansV2) and they perform flawlessly. Their (intelligent) VRAP motor controllers give more range than any comparable controller at higher power levels. Good to know. Just have to find a USA dist. meanwhile the ego-kit is the best product, while it’s cheaper and also super engineering. I’ve had three electric tricycles and had the same problem with all of them. I live in an area with steep hills. I have multiple sclerosis and need the assistance to do all of the work, taking me uphill. All of the trikes give me the same problem. The electric motor controller burns out within 4 to 5 weeks. I can’t afford to keep having them replaced, not including the down time. I can’t afford more than $1,500 to $2,000. Does anyone have any suggestions? Thanks. Supposedly the stoke monkey is designed to move heavy loads. A lot of torque… for cargo bikes. Have you checked into the Stoke Monkey? @Charles Avent: This is an easy problem. You need to overspec your motor controller. ie: If you have a 500W motor, get a controller capable of handling 1500W. The larger controllers will have more power mosfets (the electronics actually handling the power to the motor) and more heatsinking. This shouldn’t cost you any more than about $200. People selling quality upgraded controllers will also usually advertise having replaced “no-name mosfets” with quality mosfets with a “low RDS” (ask them about this, if they don’t know don’t what RDS is don’t buy from them, if they do know they’ll be able to solve your problem). Also make sure your motor controller is mounted on your bike in such as way as to get some airflow to cool it down (ie: don’t hide it inside a bag/pannier as it won’t have any air flow). The root of your problem is lacking gears for hills. ~A motor has a rpm range where its efficient, and below that speed, asking for high torque at stall speeds, makes current in the circuit, & hence heat, go a bit ballistic. Maybe add a second motor, in form of a front drive hubmotor trike with the xiongda 2 speed hub would work, & use the motors separately or together to suit. Low gear is very low, so on a 24″ or smaller wheeled trike, it should climb comfortably with a 450w version. Can use same battery if same volts, but has its own controller usually. If u can stand or lean forward on the steepest climbs, traction should be ok.
good company, good product, simple upgrade, EXCEPT, it involves brakes & axle bracket widths too, which makes ordering right tricky. Wide means u can have disks, narrow & its rim only (the motor is widish). Or, depending on your trikes drive train, its quite possible its a chain, & if so, swapping some sprockets could gear it lower to suit your climbs, at the cost of some top speed. u may have been ~fortunate. better to burn out a controller than a motor. What are some inexpensive controllers that can send more power to the GNG mid drive? I saw some guy on YouTube claiming that he got a $30 controller that handles 35-45 amps. I don’t see any $30 controllers on eBay. Is there any way to mount a mid drive to a bike that uses a BB92 bottom bracket? I bought a 2015 GNG mid drive, and the clutch in the crankset freewheel stopped working within a week with barely any riding at all, and I wasn’t even pedaling that hard. Pedaling now does nothing. I emailed GNG, and they told me to disassemble the clutch, and that would fix it. Anyone else have this problem? Not pedaling isnt an uncommon must. Loaded up with bulky shopping as I do, I simply cant turn the pedals. I cant help but think you are straining things for want of gearing. My 350 watt MTB has 21 gears & climbs all bar a cliff, loaded to the gills. Question: The review on Lightning Rods states: “This kit comes stock with two chainrings, a 32T AND a 48T.” There is no front derailleur in the picture. Does that mean it is an either or choice AND not both? does anyone have experience with the PENDIX mid drive conversion. Cant find anti nformation in English. I reached out to the company, because I’m very interested in this system. They currently only operate in Austria, Germany, and Switzerland, and the commented that they are only interested in slow growth. There is a Canadian reseller though, but I can’t find a site. A few years ago I bought a vintage peddle-cab for transporting my mother in law around, as she has to be on oxygen. We love it, and it is great, however, it only has one gear, so the slightest hill can be a challenge. I’m hopeful to add an electric motor to this bike this winter. Myself, my daughter and a neighborhood kid would like to build this in the back room of my house. So far I think I need a mid-drive motor and 24V lithium batteries. I looked at your recommendations here, which one would you recommend for my peddle-cab? Also I am looking for user friendly and economical. Any helpful suggestions in this project would be greatly appreciated! I have a men’s 26in cruiser bike from walmart and I can only go 20mph and I also live in a sim-hill area. What would be the best kit for me? Bafang mid drive are good! Hi What is the best motor for an Recumbent Trike HP Velotechnik Scorpion FS20″? original is an GO SwossDrve Backmotor or an Front midle Motor from Shimano Steps. Both has an Problems.With longer slopes of passages the engines are hot or the battery and the electronics power no longer with, what gives it there for alternative with 25 KMh and max.350Wat?